!! OMG, this weekend: Come Up To My Room !! Come Up To My Room is an alternative design show focusing on the diverse practices that work outside the norms of traditional design: multidisciplinary, independent, emerging and self-taught, all within the backdrop of our historic 120 year old hotel. Each year Come Up To My Room generates excitement in the Canadian design community as an edgy showcase for Canadian contemporary art/design practice. 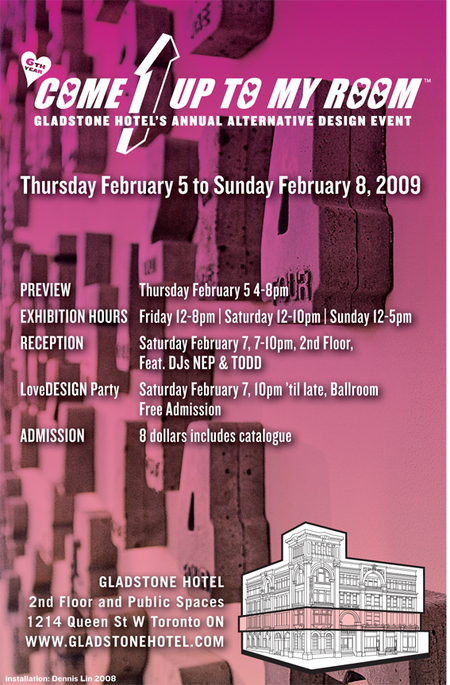 Come Up To My Room curators select participating designers and artists based on their past work. Once the “designers” have been selected they are invited to choose one of the eleven exhibition rooms on the hotel’s second floor and the curators are not allowed in until the show starts. And even if you’re not in Toronto, you can enjoy the super interesting Come Up To My Room blog year round. Be the first to comment on "OMG, this weekend: Come Up To My Room"